Today I got to spend the day in surgery and it was amazing, exciting, and bloody bloody bloody. I am just in such awe of the human body, as well as the incredible ability surgeons have to manipulate it; to heal, repair, and reconstruct it. I will also just say that I really enjoy anesthesiologists, I talked to so many of them today and they are just incredible fountains of knowledge. When the surgeons are busy cutting, breaking, suturing, and screwing bones back together the anesthesiologists stood beside us and explained exactly what was going on. We started off by going to each of the eight operation theatres where we were given a brief summary of the surgeries going on. They have two neonatal rooms where plastic surgery (used for reconstruction, not cosmetic purposes) was going on, an ENT (ear, nose, throat) room, gynecology, orthopedic, head and neck, opthamology, and a little operation room where they do surgery for whatever department has too many patients for the day. 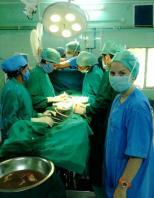 During the surgeries there are tons of people in the rooms. It is a teaching hospital, so for each person performing a necessary duty for the surgery they also have at least one person that they are teaching. It is incredible how well they conduct things with so many people in one room. The very first surgery we saw was really only the end of the surgery. For this case a little boy had either stepped into a pot of cooking food or it somehow spilled on his foot. After severely burning his leg and foot he came in for plastic surgery to get a skin graft. They had already finished the skin graft by the time we showed up, but the anesthesiologist told us what had happened and showed us the work they had done. He was such a small little boy and here he was with half of his lower leg scarred forever from this burn. They bandaged it up and we were on our way to the next room. The next surgery we saw was in orthopedics. In this operation room there was another little guy. He had fractured his arm a while back and because it wasn't treated when it was originally fractured it required surgery. The bone had healed in a way that would not allow him to fully straighten his arm. To repair this they first tied off his arm at the top to stop the blood supply, in order to avoid excessive blood loss during the surgery. After being fully prepped they cut open his arm and used something like a surgical saw to cut at the bone. They then put screws in the bone on either side of the cut. To allow for the bone to repair properly they attached a wire that was in a figure 8 formation to each screw, they tightened this wire until the bone was connected in the appropriate way for it to properly heal. After taking xrays to make sure they had done it correctly they sutured him up and placed a plaster cast on him. While they were doing xrays on the boy they asked me to step out of the room to avoid damage to my body from the radiation. During this time I sat in the hall with a 65 year old anesthesiologist. He spent the entire time talking to me about everything from anesthesiology to driving home on the weekends to see his wife as well as moving to the US. He has a daughter in the US and is in the process of getting his green card so that he has the option of moving there to be closer to his only child and grandchild. Although he has been practicing anesthesiology for over 30 years, if he were to go to the US he would have to completely start over and go back to school for three years so that he could be qualified to practice in the US. Instead he asked me what kind of things I thought he could do for work there as well. He told me he has considered becoming a pharmacy technician so that he is still working with medicine in some capacity. Our whole conversation was really interesting and I really enjoyed talking to him about his life as well as learn about medicine from him. One interesting and unusual thing about this man is that he has a home in Pune (a 3 hour drive from Loni) where his wife lives. So, at the age of 65 he drives home on the weekends to visit his wife because she did not move to Loni with him. In India this is not an unusual practice at all. After this surgery we went into the gynecology OR where they were doing a laproscopic tubal ligation. We were lucky enough to walk in at the very beginning. First they created a hole in one side of the abdomen where they had the camera and with the camera in place they used a scalpel-like tool to create a hole on the other side. It was crazy to see this tool work its way through the cutaneous layers. Once the hole was created they used another large tool to tie the fallopian tubes. For one tube they did a single ligation and for the other they did a double ligation. It was really incredible how they were able to do this all while looking at a tv screen to look at the structures inside of her body. After completing the procedure they moved the camera around to ensure that there was no bleeding. In this process they showed us the other structures in the abdomen. So on top of seeing the uterus on the screen with the fallopian tube, we also had the chance to see the spleen, the intestines, and a few other structures. In this process we also saw a ton of fat tissue that kind of looked like little balls of butter attached to each other. It was incredible to see this procedure as well as how little they actually had to cut the body to get it done. The minute they had completed this procedure they worked quickly to reverse the anesthesia process and suture her up, because there was an emergency caesarean coming in. This woman was shaking uncontrollably as they quickly placed her on the table. They gave her anesthesia and covered her for the procedure. After cutting open her abdomen the baby was out quicker than I could snap a picture with my camera. From the first cut until the baby came out, it took a total of three minutes. While they took the uterus out to suture, I talked to one of the anesthesiologists about why it was so fast. While he rubbed the baby and gave it more love than I have seen from any doctor in the last couple of weeks, he told me that the baby had been compromised. Her heart rate had dropped and they needed to get her out fast. Although she was full term, she was way below normal birth weight. This day was incredible and extraordinarily exhausting.